Webpage created: March 23, 2017. The origin of Saint Joseph's Roman Catholic Schools, Devonport, goes back to 1830, when it was started by Father Thomas Costello in a small room of a house in Granby Street. When it outgrew that the School moved to larger premises in Chapel Street. 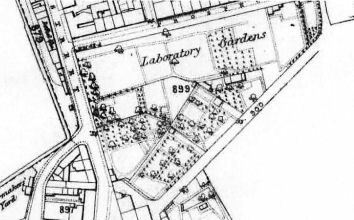 were formerly the Laboratory Gardens. 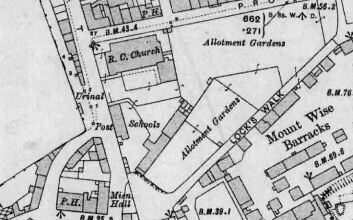 From Ordnance Survey sheet CXXIII.11 surveyed 1855-56. Finally, in 1860, it moved into its own buildings adjacent to the newly erected Roman Catholic Church of Saint Michael and Saint Joseph in James Street, Mutton Cove. The premises were enlarged in 1863. Saint Joseph's Roman Catholic Schools in 1914. Following the adoption of the Education Act 1902 on June 1st 1903, the School became a "Non-provided" School under the Devonport Local Education Authority. In 1914, just before the amalgamation with Plymouth, Mr Donnelly was the Head Master, Miss Longton, the Head Mistress, and Miss Spriggs, the Head Mistress of the Infants' School.